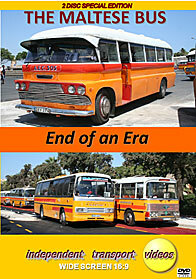 In Malta on the 2nd July 2011 almost 100 years of public transport history came to an end when the island’s privately owned bus routes finished forever. They were replaced the following morning by a completely new system of seventy one routes operated by Arriva. This two disc video programme records the events leading up to end of an era in chronological order. On disc one we start on the evening of Thursday 30th June in the seaside resort of Sliema, where some of the busiest routes operate through here carrying mostly holiday makers. A number of the old favourites are in service with standing loads just as they always have done. We start our filming on Friday morning in Valletta at the busy cross roads of Triq Sarria and Triq L –Assedju L-Kbir, before moving into the Triton Fountain bus station that would also be replaced by a brand new one against the city walls. The bus station is always busy with most types of traditional Maltese buses operating alongside the familiar former UK vehicles such as London AEC Swifts, Bristol LHs, Bedfords with Duple and Plaxton bodies to name but a few adding to the colourful mix of vehicles. We also observe some of the new Arriva vehicles on driver training and familiarisation duties. From the hustle and bustle of Valletta we move to the pretty town of Mellieha to film the buses traversing the hairpin bends leading to the town. Then it is down to the coast at St. Paul’s Bay to see buses in action along the narrow streets. We return to Valletta for the evening at the bus station. Disc two is all about the final day. Saturday 2nd July. Filming starts at the busy Triton Fountain bus station, where it is hard to believe that this will be the last time ever that these scenes will be witnessed. Our cameras move along to Triq Sarria for more action. To record the final day on other parts of the island we go to Mosta and Rabat for never to be repeated scenes of the old familiar buses plying the streets. We return to Valletta to film the buses running along Triq Sant’ Anna. There is plenty of variety, of not just the yellow buses, but also the open top tour buses, coaches and Arriva vehicles out on test. Back at the bus station we film the final departures. Most of the buses depart quite slowly knowing they will never return. At 20.00hrs we filmed the final departure from the Triton Fountain, then the final departure from Triq Sarria. Some of the buses ran on into the evening further down Triq Sarria in Floriana... This really was The End. Duration : 142 minutes (approx).